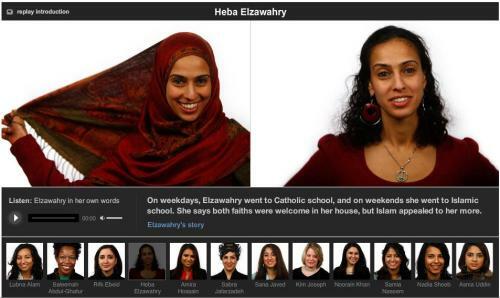 Mariam Sobh is a broadcast journalist based in Chicago and founder/editor-in-chief of Hijabtrendz.com. She is also a contributor to a book of essays entitled, “I Speak for Myself: American Women on Being Muslim.” Sobh, and other authors from this collection will be talking on the UW-Madison campus on May 5th. look for more details soon on Inside Islam. When most people hear the word hijab it conjures up images of Muslim women covered from head to toe without a spec of skin or eyes showing. When someone observes the rules of hijab, it typically consists of a headscarf and clothing that covers all of the body modestly, leaving only the face, hands and feet exposed. To make things a little bit easier to remember, hijab is basically the dress code that Muslim women observe. It should be loose and not see-through. It should draw attention away from a woman’s body parts and get people to focus more on her intellect. Oregon Act: No Religious Attire in Schools? The hijab—the veil—is one of the most visual signs of Islam. Many see the scarf and associate it with, well, oppression. Some within the Muslim communities perceive it as a way to determine a Muslim women’s adherence to faith. Amidst all these perceptions, wherever they may come from, are Muslim women who go beyond those discussions and use artistic expression to engage the question of the veil: What does it mean to those who wear it and those who do not?